Caramelized Onions are my JAM! Well, not literally, but there’s an idea, for a recipe, huh? But today, I used them in a healthier Skinny Caramelized Onion Dip. Perfect to take to a party or serve at home. There’s no loss in flavor, just because this is “Skinny” – the caramelized onions are so good in this you won’t miss the extra fat and calories. And the yogurt is the perfect, tangy foil for the rich onions. Be sure to sprinkle this dip with few green onions – to warn everyone that this is healthy. Just kiddin’. Just add them because they’re pretty and there’s already a few in the recipe. You know I can usually toss out a recipe like this at almost a minute’s notice. That’s because I make up a big batch of Caramelized Onions (3 to 4 pounds) whenever I need some and divide the extra up in freezer bags. Here’s a link to take you to Three Ways to Caramelize Onions. You might want to double this recipe. Combine 1/2 cup caramelized onions, minced green onion, cider vinegar and yogurt in medium bowl. Season to taste with salt and pepper and serve. If time allows, this dip is better after it sits and even better after a day. May be refrigerated in airtight container for up to 3 days. Note: if the yogurt isn’t a good, thick brand, place about 1 1/2 cups in a paper towel lined strainer over a bowl. Set in the fridge for a couple hours or overnight until yogurt is of desired consistency. If you feel it’s gotten too thick, stir some of the whey (the liquid in the bowl) back in. Place the oil, onions and 1/2 teaspoon salt in a 10-inch saute pan over medium heat. Cook, stirring occasionally, until the onions are golden brown, about 25 to 30 minutes. Remove from the heat and set aside to cool for 15 minutes. I’ll be bringing this recipe to Fiesta Friday 201, hosted this week by Monika @ Everyday Healthy Recipes and Jhuls @ The Not So Creative Cook. Fiesta Friday’s already filling up with all kinds of holiday goodies & recipes, so be sure to stop by! This entry was posted in Click here for Fabulous Food Posts and tagged Appetizer, Caramelized Onion, onion dip, onions, Spreads and Dips, Vinegar, Yogurt. Bookmark the permalink. Hi Laura, thanks much, and sorry to reply so late! Happy New Years to you!! Same to you Mollie – Happy New Year! lol! So true!! Sorry to reply so late, KR – it seems I missed a lot of comments this last month! Happy New Years!! This would be great with baked potato chips! 😀 Sounds so yummy! Thanks for sharing, Mollie & happy Fiesta Friday!! Now if we could just do something about the chips! Thanks Monika for hosting for us!! Someone on here mentioned veggies, lol! For me, it’s hips, chips chips!! Well, to tell the truth, I usually have them FOR dinner, lol! Hardly civilized, I know!! Omg, give me a bag of pita chips and I would go to TOWN on this. caramelized onions are pretty much a condiment for me, I put them on everything possible lol great recipe Mollie! I love them too! And ever since I’ve learned to keep small bags of them in the freezer! Well it’s almost a little dangerous to think I can make dip whenever I want!! Thanks much! Sorry to reply late! 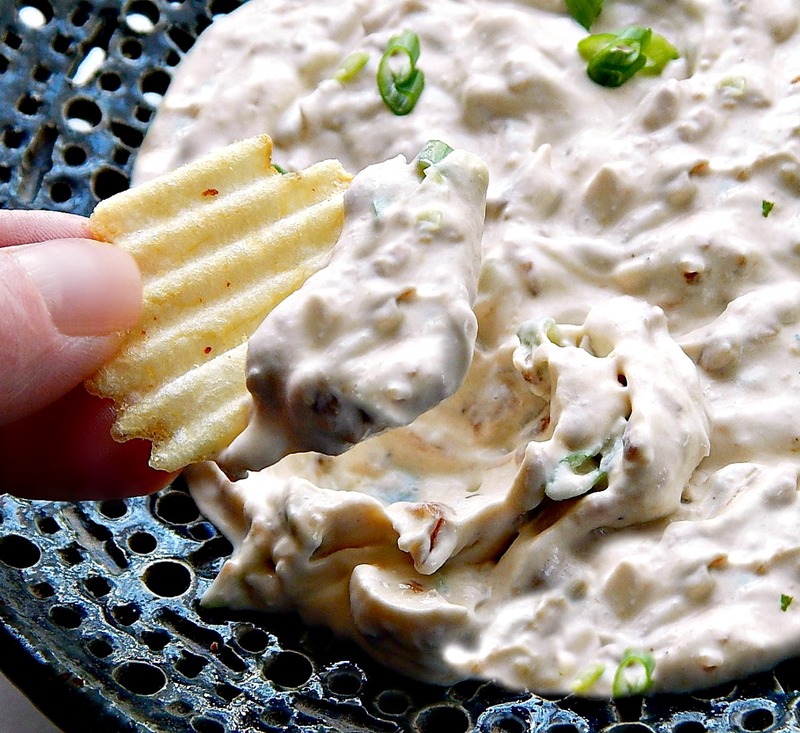 I will never turn down an onion dip! Not even if it were a first date, lol! Luckily, I resisted! This time, lol!! Looks good to me. I may have to try this for my New Year’s Day open house. I’ll secretly put it out and not let people know that it’s healthy and see what they say. lol – maybe they’d rather know! An open house sounds so fun! Are you going to post it? Or does that deviate from your theme? *S* I’d love to see what you’re making! I’m impressed! I need to plan more!